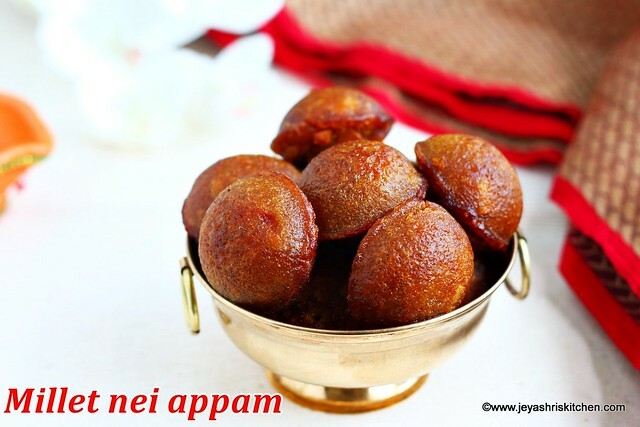 Nei appam | Unniyappam is a traditional sweet generally prepared in our homes for Karthigai deepam, Janmashtami,Ganesha chaturthi and avani avittam. I have already posted nei appam, wheat appam and many more Karthigai deepam recipes. Two years back, when i learnt the recipe of Traditional Mysore pak from my friend's mom, she told me the recipe of Nei appam too.Though i noted down the measurement of rice:jaggery, i didn't note down anything else. But i remember the way she was explaining to me. So i tried the same using millets instead of rice. Varagu and Thinai will work out very well for sweet appams. 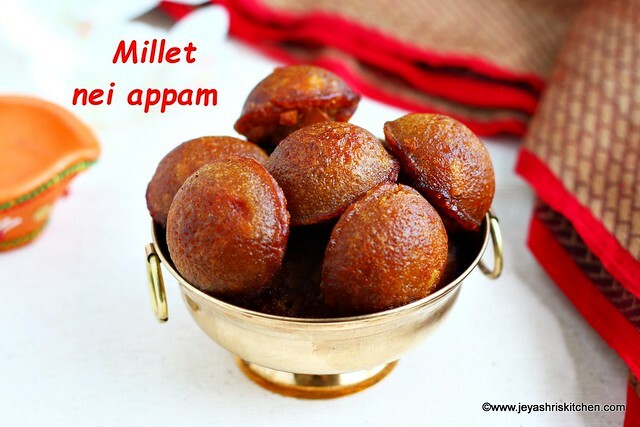 I used Samai(little Millet) for making this nei appams and they turned out very well. Check out my full collection of Karthigai deepam recipes. Wash and soak the little millet for 2-3 hours.You can use kuthravali(barnyard millet) or thinai(foxtail millet) or varagu(kodo millet). Drain the water and grind this in a mixie till it gets a coarse texture. Add the banana and jaggery to this. Grind till the banana gets mashed completely. Alternatively you can melt the jaggery with little water and filter it and keep aside. Grind the batter with banana and add the jaggery syrup when it is warm. Let this sit undisturbed for 6-8 hours. Let the batter consistency be like dosa batter. Fry the coconut bits in 1 tblsp of oil till they become golden brown. You can add 2 tblsp of grated coconut too. Fry this in ghee till golden brown and add. Add this to the batter and add cardamom powder. In a paniyaram pan add ghee till it fill 3/4th of the pan. Pour one big spoon of batter to the paniyaram pan. Cook this till it is done on one side. Gently flip this using a fork or a steel stick. Cook this till it is done. Repeat this for the rest of the batter too. These appams will stay super soft inside and crispy outside even after 3-4 hours. If the batter is too thick, it will make hard nei appams. If it is too watery, add 1 tblsp of rice flour to this and bring it to the right consistency. You can add a pinch of baking soda to the batter before making the appams. Raw rice or sona masoori rice can be used instead of millet, to make these nei appams | unniyappam recipe.